Today I want to get right to the point. So much of the information floating around on the internet relating to home recording is a waste of your time. I can say this confidently because a good chunk of the advice and articles written (and posts on forums) tell you to “buy this XYZ preamp, or XYZ converter and you’ll have better recordings…” Or they’ll tell you to spend a lot on nice monitors and room treatment, or top of the line cables, or a vintage microphones…and the list goes on and on. Now, of course there is some great gear out there, and if you have money to burn (and more importantly) know how to USE the dang stuff, then it can definitely be an added bonus to take the plunge on some of that equipment But I won’t tell you do any of that here. And this post will be a good example of why. Here’s a hint…it’s not what you use, as much as it is how well you use it! When I started out home recording as a hobby years ago I learned one thing early on. To get a good recording, you need a good microphone. Not an expensive microphone, just a good one (and the right one for the job). Some good advice came my way encouraging me to purchase a large diaphragm condenser mic. So I took the plunge and coughed up $100 to purchase a Behringer B1 mic (complete with road case, shockmount, and windscreen). Back then it was a lot of money, but it has paid dividends over the years. Now, the B1 is a simple studio microphone. Nothing fancy about it all. I recommend it to people all the time, along with a handful of other great mics just like it. Honestly it didn’t matter so much that it was the B1 that I got, just that I got it. Microphones are how we capture physical sound waves and convert them into an electric signal for recording (either digital or analog). So we know we need microphones. But the problem comes when we hear that we need all sorts of different microphones to get the job done. Or even worse that some mics are “better” than others. All of this information is a distraction from actually making music. If you are expending energy “deciding” which mic to buy (or worse) which one of your mics to use in a given situation, then you are missing the point. You see, the key to getting a good recording is just diving in. What you and I need to do is purchase one quality $100 large diaphragm condenser mic and start learning it. Learn what it sounds like in front of your acoustic guitar on the 12th fret versus the sound hole. Learn what it sounds like in front of the center of the speaker in your guitar amp versus off center. Learn what it sounds like on your vocals in your bedroom by the wall versus in your closet. Eliminate the variable of which mic, and focus on where to put the darn thing to get a good recording! Almost a decade later (and much money spent) I still come back to my beloved B1. I’ve used it for vocals and acoustic guitars like crazy on the last 3 projects I produced. Is the B1 just that good? Well yes and no. It is a great microphone. It’s quiet, accurate, and simple. It does what a microphone should do…capture the source you put in front of it well. But the reason I love the tracks I’m recording with it is because I’ve learned how to best use the B1 in a given context. I’ve learned to make the mic “hear” what I want it to hear. And that my friends is the crux of this post. Microphones are just tools. The better you know how to use it, the better your recordings will be. So don’t listen to the hype online (except for this blog of course). If you haven’t purchased a solid $100 mic already then today is the day. Get it, use it, learn it…but don’t blame it for bad recordings. Better recordings come with time, experience, and trial and error. In time I believe you will find that this microphone will serve you for years to come and could possibly be the best $100 you ever will spend! You can bet me on it! Very interesting thoughts and from my stand point your spot on . I think many people get lost in all the gear aspect and forget its about the music . The gear is cool and fun but its just a tool to get your ideas onto your prefered media . Also mastering the skill of capturing sound requires gentle precision and playing around so one learns what works for them . I found that the sounds the Behringer b1 captures have a very real quality . Thanks for the comment Criss. I agree. The art of mic placement seems to get lost as people switch around microphones too much and move on to the next purchase. Glad you found my site. Cheers! great philosophy behind your work…. simplicity… I love it… unluckily in media and music or event businesses, same broadcasters lover to use huge expensive equipment. They spend millions… come with armadas of trucks, tons of equipment… Like: hey, we use the most expensive stuff… look ! – Aren’t we awesome cool ? – There exist many example of recordings, e.g. big bands using old microphones 60-70 years old… or just using a “natural studio room” and the recordings had been of amazing quality… its the method and menthal attitude which makes a recording great… you are an excellent example of this “make it simple” thinking… tks, you encourage people who come from nowhere without big money in the pocket… just clever in mind, good ears and the love and passion to succeed a great result of work. Thanks so much ElJay for the comment. Glad you found the site! Graham, thank you so much for your site! I’ve been learning a lot and it looks like I’m going to be the “the recordng guy” in my little band of “50 somethings” looking for a little of the old “glory days” (I’m the drummer). I have just ordered PT 9 and plan on picking up the M-Audio Profire 2626 per your suggestion. Besides your website, do you have any suggestions for a good audio mixing reference book? Hey Larry, thanks for the comment! Glad you’re digging into recording and Pro Tools. You’re gonna love PT9! 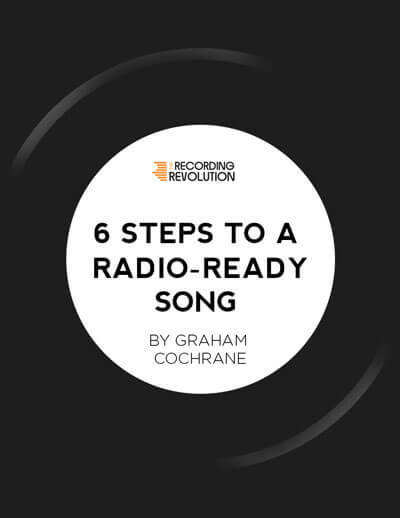 As far as audio mixing books, the classic one would be “Modern Recording Techniques” in its most recent version. But there are a ton! SE X1 is a beauty for a cheap and quality condenser (about 100 pounds) it is comparable if not better in some situations than the NT1, def worth a look and listen tho! I’m planning to record drum using the Glyn John’s method and I currently have a Rode NT1a mic and can get my hands on dynamic mics for kick and snare. However, I need to buy a second condenser but don’t want to fork out for a second Rode NT1a. Is it possible to record using the Glyn John’s method if the two “overhead” condensers are not matched. I was thinking of buying a Berhinger B1 but want to check whether or not it will work well along side the Rode mic. Yes, technically you can totally use another mic for the second overhead, but i wouldn’t advise it. I’d personally rather use just a mono overhead until I could save up and buy a second NT1a. Just a thought. I think I’ll begin with just the single NT1a as the overhead with kick and snare mic’d also. I have one other question though, in your opinion would it be more useful to buy a second NT1a to have a pair of large diaphragm condensers or to buy a pair of Rode M3s which are small diaphragm condensers, giving me a larger range of mics to work with. The two M3s cost the same as one NT1a. Hi Andy, great question. That’s completely up to you. I LOVE the NT1a on just about anything so I’d probably lean to second one of those. But I like where your head is at! I’ve been watching your videos over and over and am still putting together my home studio. I lack only a couple of things and one of them is a large diaphragm condenser mic. I’ve been looking into the CAD GXL3000 mic. Have you had any experience with this particular mic and would you recommend it? What I like about it is its multi-pattern capability. Any comments on this would be appreciated. Thanks again, Graham. I love your web site. Hi Michael, haven’t used any CAD mics but people seem to like them. Also consider the AKG Perception series of mics. They have an affordable multi pattern condenser. I would like to get into all the recording stuff but the only thing I have is an old PC and not much money. Buying a large diaphragm condenser microphone for 100$ sounds like a really good idea for me, but then I would also need something for the phantom power. So I need a pre-amp right ? The purpose of your article is to help us start quickly recording with minimal money right ? So what pre-amp do you suggest I buy ? Or should I go for a USB kind of microphone ? I recommend a simple USB audio interface. It acts as your preamp and your converter/sound card. I’m a recent reader to your blog, and now I wish I had found this gold mine earlier! And my deepest regret is that I am seeing this page after I bought my home studio setup. And that’s not because it was expensive than what you recommend – it’s a lot cheaper, especially the mic. I bought in a pair of Behringer C-2 for my guitars AND lead vocals for 60$ (back then I hadn’t much idea about recording) , and what I now find you recommend is a single 100$ mic. I may sound crazy, way opposite to the gear lovers you keep mentioning, but I can’t afford to invest in another mic or other gear. I’m already making recordings, and I can’t say I’m not satisfied with my tools, AND I’m constantly getting inspired by your it-is-not-about-the-gear concept, but still it pains me to think that what I own is way too lower than what you recommend. So please clarify me on this, is a 100$ mic n absolute necessity, or can my C2s do the job for me? The C2s are totally fine. The $100 figure is purely because it’s so common. I have used cheaper mics like the Samson C01 with great success. The point is that you don’t need anymore than $100 to get a great mic. Thanks Graham, I’ll keep that in my mind. And may I believe that being a small diaphragm condenser won’t count against my C2? People always seems to prefer LDCs for vocals and guitar..
among live instruments I only record a vocal using condenser mic with a larhe diaphragm. Do I need other types of mic and what budget models could you recommend? I’ve been following your work for probably a year or two now. I do not want to be “that guy” here, but I have to slightly disagree with you. I completely agree about mic placement, and for purposes of your site hear I agree a very good recording can be accomplished with a basic $100 microphone, but to say that the type of mic doesn’t make a difference is way off. Now, I’m not trying to bash your teaching, but my experiences have taught me that each different mic, preamp, or outboard piece of gear has a specific kind of sound. Some are warmer, some brighter, etc. I would say that the type of music a person is recording is a big determining factor in this. If you want deep low end out of a vocal, a basic condenser microphone will be…ok…but you will have to put a lot of time into using plug-ins to make it what you really want. On the flip side I can use a large diaphragm tube condenser microphone that will give me what I need with a clean recording with less effects processing. Again, it just really depends on what it is you are wanting to get out of the recording. I’m open to polite and honest feedback and constructive criticism so please let me know your thoughts.